How about an international award for hypocrisy? Arising out the will of Alfred Nobel, the Swedish chemist who invented dynamite, the Nobel Prize is universally recognized as the most prestigious award in the fields of peace-making, economics, chemistry, physics, medicine and literature. How about an international award – without the gold medal, the diploma and the money – for hypocrisy? Such an award could be called the Lebon Prize (reversing Nobel). If there was such an award, the statements of European and American leaders in the immediate aftermath of Russia and China’s veto of the Security Council resolution to end the killing in Syria suggest two most obvious nominees for it. One is William Hague, Britain’s Foreign Secretary. The obvious implication is that it’s not good politics and policy to be on the wrong side of that opinion. Really? Then how do we explain the fact that all the governments of the Western world, led by America, are on the wrong side of it because of their support for the Zionist state of Israel right or wrong – unending occupation, on-going ethnic cleansing and all? There is a one-word answer. Hypocrisy. No doubt readers will have other suggestions, probably many, for nominations for a Lebon Prize for hypocrisy. 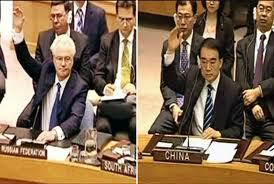 Hague also condemned China and Russia for “betraying the Syrian people”. It apparently doesn’t matter that the British and all other Western governments have been betraying the Palestinians for decades. There really is no end and no limit to the hypocrisy. Wasn't it just reported that UK military is involved in Homs, 'aiding' the 'revolutionaries'? As someone wrote some time ago...it is the Anglo/Saxon axis that bears watching, not the 'axis of evil'. I would definitely nominate Barack Obama (after stripping him of the Nobel Peace prize he got so unfairly in 2009), for the extrajudicial killing of Anwar al-Awlaki and for threatening the American peace activists who were to sail on the Audacity to Hope to Gaza last year with charges of material support for terrorism. I could go on but these are two of his worst human rights crimes. One thing is for sure. It is much more easier to win the Lebon award for hypocrisy then it is to show those achievements that would win a person the Nobel. Why do these people do this? What are they expecting to gain? What should it profit a man if he gain the whole world and in the end lose his own soul? After the ending of the world as we know it is finally finished, I hope that many of you have made the right decisions to walk upright, honest and in that direction the Lord God leads. I would like to meet you on that other side. I will not be surprised if William Hague do receive the prize on recommendations by Conservative friends of Israel. In 2010 - Haque told them "I am a natural friend of Israel”, and to prove it he asserted that “it would be a mistake to ever rule out military action against Iran". The Nobel Peace prize is already an award for hypocrisy, and it does not even need to be spelled backwards or anything. They gave it to Obama, a war criminal in the manner of Bush, though a little more articulate in his presentation. I wrote to the Nobel people telling them they had reduced the peace prize to a meaningless trinket by giving it to a war criminal, but of course they did not reply. I imagine the Nobel committee is very embarrassed at their poor judgment - at least they should be. I've heard there is a movement to ask the prize be given to Bradley Manning. He deserves it much more than anyone I can think of.